A new era of Wi-Fi connectivity is already underway. The software and hardware are already developed, while 5G and Wi-Fi 6 are being implemented across the globe. But while this is happening, many people are still using older generations of router equipment. With few exceptions, any router that wasn’t made in the past two years is not going to be adequately prepared for the future. Bandwidth isn’t the only thing these new technologies can offer. They can ensure that certain network tasks, like your streaming video, are among the very last things to be disturbed when your network is under strain. And as an increasing number of smart-devices begin to fill up our homes, there’s a growing incentive for your router to be equipped to accommodate multiple tiers of connectivity. Who was the Nighthawk AX4 made for? A quick glance the port array will show you this router wasn’t made for industrial use. And an evaluation of its internal hardware reveals this router is probably a little too powerful to be used in two-bedroom apartment. Rather, the Nighthawk AX4 was made to help fill broader areas with a heavier signal. Want to extend your Wi-Fi network out towards your backyard? The AX4 might be able to help. Apart from the above average signal radius provided by the antennas, the AX4 was constructed to provide virtually every one of the latest networking standards. That means getting all their associated benefits, which allows the AX4 to carry roughly four times the data capacity compared to previous generations of Wi-Fi. Nighthawk routers tend to be either mid-range or high-end routers, with few exceptions. The Nighthawk AX4 seems firmly in the midrange section. That means this equipment tends to be well suited for people who need a little more than what the most basic routers can provide, but a little less than some sort of business-tier solution. The AX4 uses a professional looking black-and-gray chassis that’s been latticed with a cool textural design. It definitely looks pretty distinctive and modern. 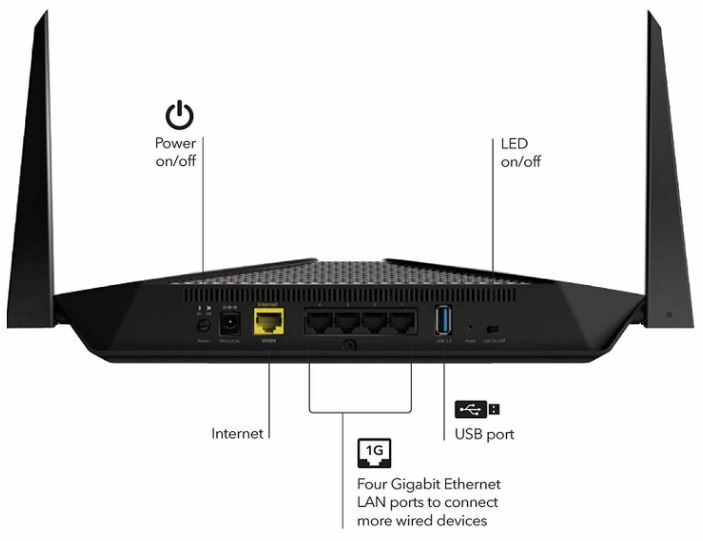 And the AX4 is actually one of the more compact and slim routers in the Nighthawk series. With a hexagonal shape that extends roughly 14.7 x 8.4 x 2.3 inches, this router certainly looks unique. The predominantly horizontal build looks a bit like an old answering machine, or rather, what an answering machine might have looked like if they were still popular in the 21st century. With respect to its height, keep in mind, that 8” is on account of the two high-performance antennas. It’s otherwise pretty slim. The antennas have their range maximized and extended for both indoor and outdoor coverage. Unfortunately, these antennas can’t be removed. But because the included antennas are optimized in relation to the hardware behind the AX4, so there’s little reason for considering their replacement anyway. You’d be better off adding another router and creating a mesh network instead of trying to extend the antennas, anyway. The AX4 weighs about 1.3lbs, making it a little on the lighter side. Even though there is no mounting hardware included with this kit, the lightweight nature of the unit ensures it wouldn’t be tough to rig your own simple wall mounting solutions. You could probably use a couple of pieces of sticky tape and get the job done, though again, none of that is included. Apart from the front indicator LEDs, Netgear didn’t go out of their way to slather this thing with a bunch of unnecessary lights. 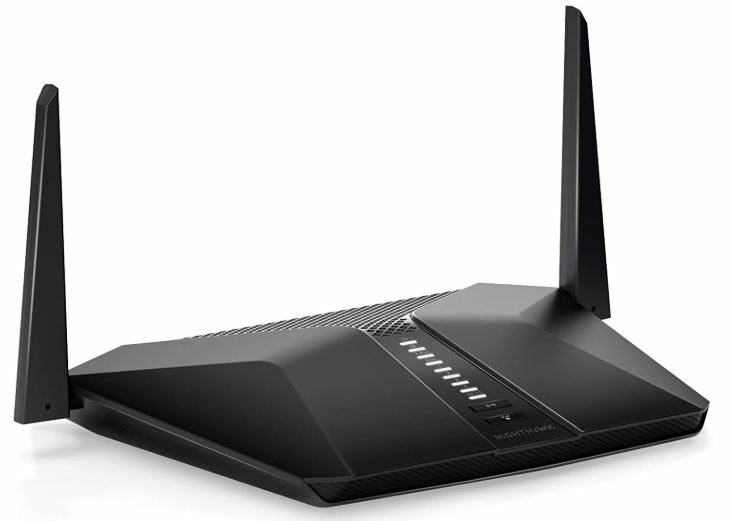 Some of these Nighthawk routers look like Christmas trees, while others look more like business equipment. The AX4 tends to be more in the latter category. That’s probably a good thing because if nothing else, it means you’re not paying for a bunch of style-only LEDs you don’t care about. The backside of the unit has a pretty standard layout. On the far left side, you’ll find a power on/off button, and a DC power port. They’ve positioned those two together, instead of on opposite sides, like so many routers end up doing. It’s a minor detail, but getting these minor details right is reflective of the smart design that permeates the entire device. It’s almost as if Netgear has been making routers for decades or something! Anyway, along the front of the unit, you’ll find nine LED indicators and two analogue buttons. The LEDs are pretty standard network indicators, giving your insight into the power, network connectivity, 2.4/5G wireless band connectivity, and the status of all the devices you’ve got plugged in on the backside. It’s a pretty great interface for helping you quickly narrow down network connectivity problems to their source. Netgear didn’t make these LEDs particularly small. In one regard, that’s a good thing because it means they’re much easier to see and work with. But if you were positioning this router in a sleeping area or a dark workspace, it would be worth noticing the LEDs are actually pretty bright. Could be a bit distracting in the wrong area. Moving past the power, you’ll find the WAN port has been highlighted bright yellow to distinguish it from the Ethernet ports. It’s also set off to the side, giving it physical distance from the Ethernet ports as well. Another small detail, but it’s a pretty smart design for people who aren’t super comfortably setting up their own networking equipment. Towards the center of the I/O, you’ll find four gigabit Ethernet LAN ports, each capable of connecting additional wired devices. There’s also a USB port, a reset button hidden away inside the chassis of the AX4, and an LED on/off switch. Some of these Nighthawk routers have taken to moving their USB port on the front side of the unit, but the AX4 is not among this group. Having the port placed on the backside is slightly less convenient, but isn’t really much of an issue unless you’re making regular use of that port. 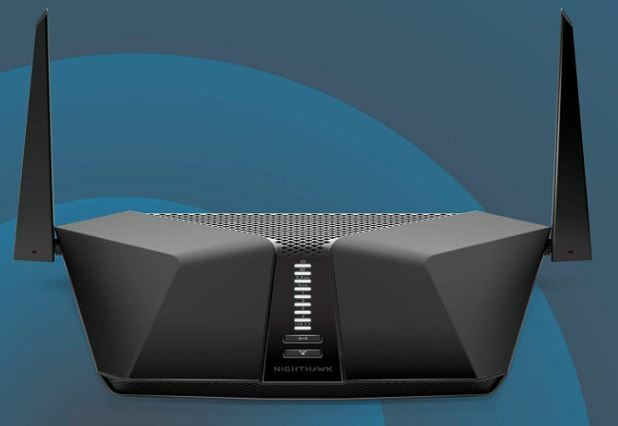 The Nighthawk AX4 was constructed to provide a four steam Wi-Fi network. It’s the result of mixing a 600+2400 Mbps setup together for some pretty amazingly fast wireless. And that’s in addition to the four gigabit Ethernet LAN ports on the backside, which can provide wired devices with equally formidable uninterrupted connections. 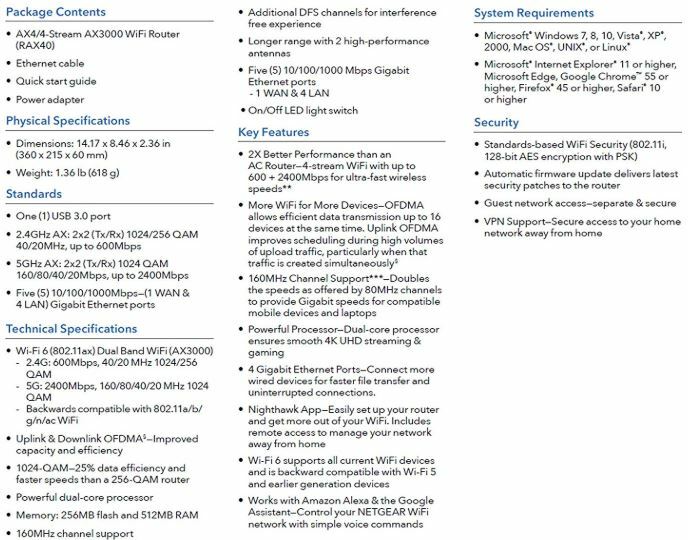 If you’re not familiar with router tech mumbo jumbo, that means you can get 600Mbps of connectivity across the 2.4GHz band, and 2400Mbps on the 5G band. The 2.4GHz band is the one that can bounce around from room to room, while the 5G band basically requires line of sight with the AX4. In order to handle higher network throughput, the Nighthawk AX4 was constructed with a pretty powerful Intel 1.8GHz 64-bit quad core processor. With a processor that powerful, you can transfer gigabits of your data with almost no load on the CPU. It’s only when you start connecting more than a dozen and a half device that you will see the CPU come under some strain. The rest of the hardware is equally well-rounded. The AX4 was constructed with 256MB of flash and 512MB of RAM. You’ll find 160MHz channel support and 1024 QAM are in place to help greatly improve the extent of your network efficiency. OFDMA technology enables more efficient transmission of data, extending network benefits to a total of 16 devices at the same time. As you move from one Nighthawk router to the next, you’ll find security support is almost identical. Virtually every Netgear router, even their most budget equipment, includes some pretty formidable support for security. That includes things like automatic firmware updates, parental privacy settings, and the ability to create guest networks. It’s only when you start getting into the weeds that you’ll find real differences between the Nighthawk AX4’s security and the security features of similar equipment. For instance, the AX4 has some routine support for VPNs, but it doesn’t have the kind of robust support you’d want from a business router made specifically for creating private local area networks. Likewise, the AX4 uses much of the same standard control software as other Nighthawk routers. And Netgear’s control app is pretty smooth. They’ve certainly polished it over the years, continuing to find new ways to make it a little more intuitive or approachable. With a feature that’s increasingly common to the Nighthawk series, the AX4 is able to work alongside existing Wi-Fi devices to extend the range of your network. 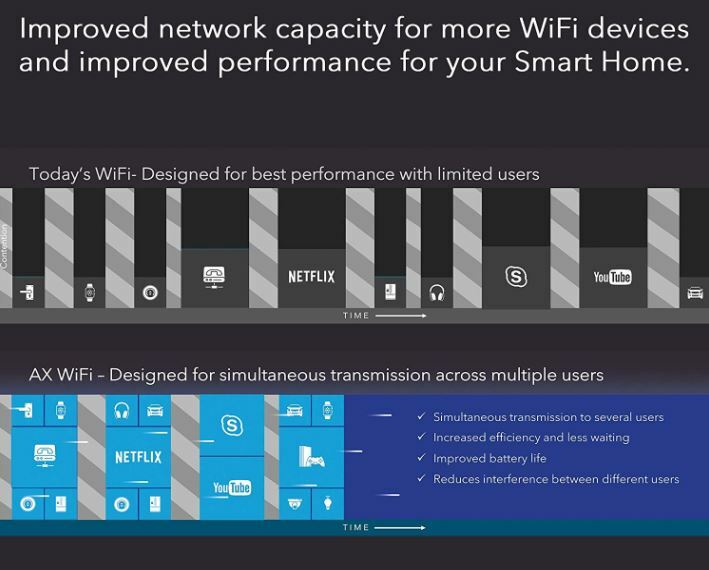 It’s backwards compatible with 802.11a/b/g/n/ac devices as well. Netgear includes a one-year warranty with all of their routers, as well as 90 days of free tech support. The fact their tech support isn’t unlimited is mostly a testimony to the quality of the support. Who Should Choose the NETGEAR Nighthawk AX4? The AX4 was made to help support a busier type of wireless environment. For two people in a small apartment, this kind of router wouldn’t make much sense. Because it was designed to help extend essentially flawless connectivity to about 16 devices. If you keep piling on devices after 16, then you’re going to run into some network congestion. You can prioritize certain aspects of your network to help ensure that the congestion doesn’t result in noticeable impacts for what matters most. But if you wanted to get more than 16 devices on the network, you may also want to consider a different Nighthawk router. For people who are considering upgrading their current router, compared to an AC router, the AX4 offers essentially double the potential performance. Performance benefits are especially strong for people who are able to relieve themselves of existing network congestion. The AX4 is also pretty good at extending your connection over distances. The 2.4GHz band is quite adaptable, and with the help of the high performance antennas, you can get your signal moving out towards 3,000 sq. feet. For someone who can take advantage of that kind of power, the Nighthawk AX4 is worth careful consideration.